Glamp this summer at Windhover Performing Arts Center in fabulous, rustic, unique cabins with all the amenities you will need. You will take one restorative yoga class and four vinyasa classes, eat locally inspired meals, relax on-property enjoying nature and the sun, perhaps get a massage, and hike in the state park. There's also a bathhouse complete with hot showers and toilets, so you'll be far from roughing it. End each night, gather around the campfire and roast some s'mores. It’s time to leave the makeup and hair dryer behind. Grab your comfy clothes and your best friend and join this amazing experience! Windhover Performing Arts Center is a dance camp which offers its facility for yoga retreats. This is a quaint and rustic venue. This offers charmingly rustic shared cabins with double or triple occupancy. All cabins are uniquely designed by Hugh. Limited singles are available for an extra fee. Bathroom and shower facilities are located in a separate centrally located building. No air conditioning is available, however, fans are provided. The style is very much like going to summer camp! Meals are served from the music barn which boasts a kitchen and large casual living room setting seating. Most meals will be enjoyed at the outside picnic area so you can enjoy the nature of the countryside. Yoga is held in the large airy studio space as well as the outdoor performing arts area. Join 22 amazing women on this wonderful escape from the hustle and bustle of your daily life. This yoga retreat is designed to recharge your energy, rejuvenate your body and mind, and leave you feeling inspired, refreshed, centered, and peaceful. 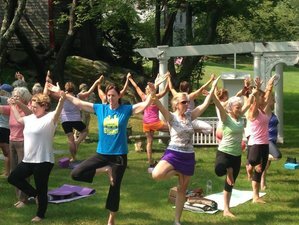 This yoga retreat is a unique opportunity to relax and take a break from the stresses and strains of your daily life in the beautiful seaside village of Rockport, MA. It is not like any other holiday you have experienced. Enjoy the planned activities or relax and enjoy the quiet, therapeutic serenity. Delicious meals will be provided by local chefs. The will also be an aromatherapy workshop, a creative art project, yoga and meditation, breathwalk meditation at Halibut State Park, swimming in a local quarry or beach, and more. Enjoy the campfire at night with girl time for laughter and fun. Quaint cabins offer you deep rest after days spent in nature. Awaken to the symphony of birds greeting you each morning. Rise early to catch the amazing sunset at nearby Halibut Point. If you never spent time at camp as a child this your opportunity to capture the essence of camp in a more relaxed and soothing manner. Grab your girlfriends and join Real Life Yoga for an adult adventure that builds lifetime bonds with new friends and deepen the ones with others. Connect with the amazing power of women as you leave your worries behind for three fantastic days! This class is great for the beginner as well as the novice yogi. It includes pranayama (breathing), sitting, standing, and lying asanas (postures), ends with a yummy savasana (yoga nap). Nancy’s fun spirit gently guides you to bliss. In this retreat, you will have breath-walk meditation at Halibut State Park on the rocks. Nancy will be an instructor on this retreat. This retreat will take place at Windhover Performing Arts Center in scenic Rockport, Massachusetts. It is a magical place located in historical, scenic Rockport, the place of art culture. It was founded in 1968 by Ina Hahn and her husband as a dance camp and has since emerged as a center for the performing arts. The charmingly rustic cabins at set on five acres in a country like setting in this Oceanside town, next to the magnificent Halibut State Park, home of the quarries and rocks formations of the coast. These are located one mile from the commuter rail, a very easy commute from all locations. You will be served two dinners, two breakfasts, and one lunch during your stay. All meals are catered one of the best local restaurants which serves you healthy and delicious local foods. Follow Route 128 north to the rotary in Gloucester. Go halfway around the rotary and continue on the extension of 128. Then, go halfway around another rotary shortly after this. At the bottom of the hill, at the traffic lights, turn to the left to Rockport. Continue about 3 miles until you come to a 5-way intersection (five corners) and turn left (Railroad Avenue to Pigeon Cove). Stay on this road, which becomes Route 127 around Cape Ann. After about 1.5 miles, you pass a large factory building on the right (ocean side) and climb a long graded hill. At the top of the hill, watch for the blue and white sign saying “Windhover” on the right. Drive into the parking lot near the sign. Park and walk through the field. Please book your flight to Logan International Airport (BOS). Transfer from and to this airport is available at an additional cost. Take the commuter rail to Rockport from south station in Boston, which is accessible from Logan International Airport (BOS) as well. Transfer from the commuter rail is available at an additional fee. Real Life Yoga Studio is a nurturing environment providing yoga classes accessible to all-real yoga for real people.